In Ernest Adams’s work “The Role of Architecture in Video Games”, the author begins his argument with the example of “the most popular PC game of all time, The Sims.”He casts it as a game that embraces and embodies the ideas of Christopher Alexander, one of architecture’s most celebrated philosophers. Adams lauds the use of ideas detailed in Alexander’s work A Patten Language within The Sims. Though he makes a promising start, Adams’ analysis never quite gets below the surface of what architecture has to offer. He only sees the use of architecture through the design and use of buildings to affect a game. While architecture is focused on construction and design, it is the field’s teachings on spatial organization and how it can influence group and individual behavior that I feel would be more interesting if used in games. Sid Meier’s Civilization V by Firaxis Games is a good example of a game that uses core architectural concepts of spatial design and organization to affect players through the course of a game. From the outset, the game is organized across a grid system. The player remains focused on the cellular structure of the game throughout the beginning as it is the vehicle by which the player progresses. The grid is the central, granular metric of the game, and so sits at the heart of resource management and governs how the player’s abilities evolve as they build cities. "Workers developing a city in Civilization V.
The dynamic and relationship to architecture within Civilization V shifts when the player encounters the first foreign empire. While the grid structure remains a focal point for the player, the encounter unlocks a new dimension for the player to consider when regarding the game’s world. With the introduction of foreign empires, the game extends the player’s perspective beyond a consideration of cells (physical game space) to a nation-map system of organization space and societies. 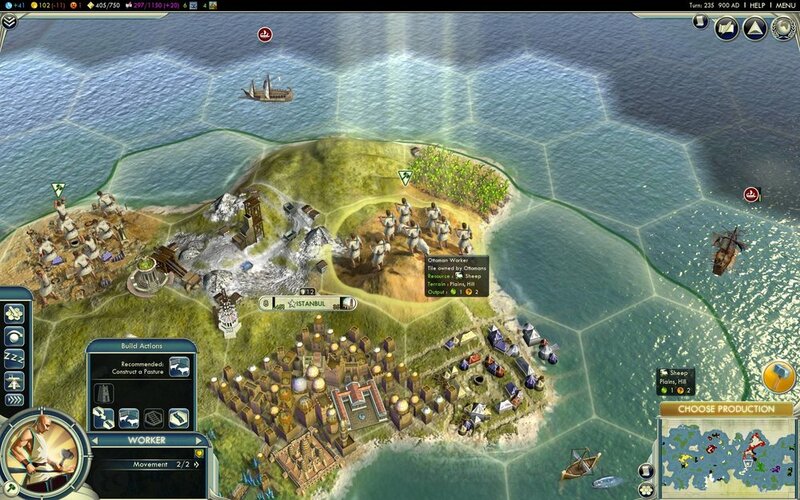 Three civilizations meet in Civilization V.
The further the player progresses into the game, the less the cellular structure of the game’s resources has dominance over the player’s considerations. The player begins to think in cities instead of individual farms, and regions instead of cell clusters. The player also develops the technology to travel larger distances, introducing a global perspective to the game. This broader spatial scope is accompanied by new considerations regarding diplomacy, religion, trade, and conquest. As the player matures within the game, the game’s scope extends both outward, across a larger spatial distance, and inward, as new systems are introduced, structure becomes at once more complicated but also more intricate and more elaborate in its goals and perspectives. Sid Meier’s Civilization V illustrates how spatial organization and theory are best in order for a game to challenge and grow with a player. A small set of decisions in the beginning is facilitated by a drawn-in spatial scope. As the player matures, and as they reveal more of the map, the game likewise expands in scope. Although the game does have smaller goals that do revolve around the construction and completion of certain buildings, that is not the focus of the game nor the most poignant element of the game. It is the use of architecture, and the spatial shift in perspective with the game’s evolution, that make it so successful. Adams, Ernest W. “The Role of Architecture in Video Games.” The Role of Architecture in Video Games. N.p., 9 Oct. 2002. Web. 30 Mar. 2017.